You have high standards – and at The Ambassador, you will find living accommodations and care that meet those standards. Every detail has been thoughtfully planned to anticipate residents’ needs now and for the future. Here, you will discover luxury in the form of world-class hospitality and amenities, elegant residences, professional programming and concierge services, plus around-the-clock personalized assistance; our care plans are tailored exclusively to each resident's lifestyle and needs. 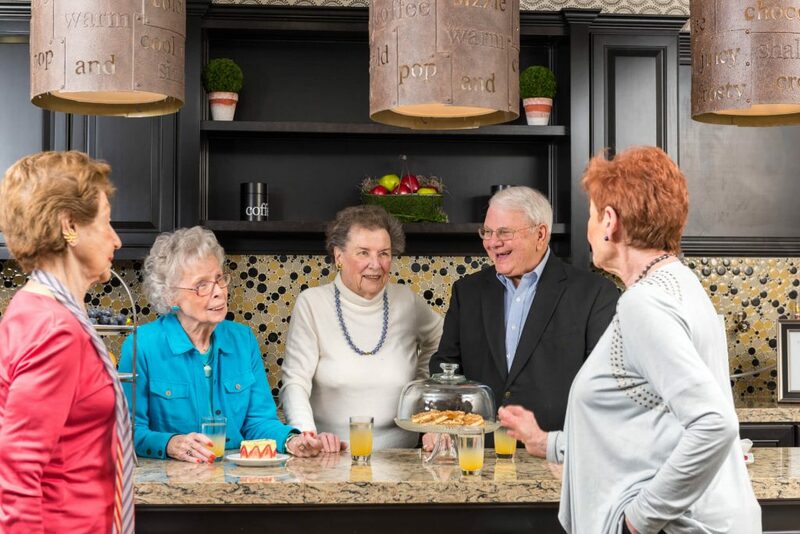 Our Memory Care Community, a secure community with gracious accommodations and access to an enclosed garden, caters to residents with Alzheimer’s and related disorders. Our first-class community offers residents programs and comforts tailored to their lifestyle. Whether relaxing in their new apartment, taking part in the many social and recreational opportunities, or treating family to first-class dining on-site, residents of The Ambassador of Scarsdale are immersed in all the best life has to offer with the added luxury of peace of mind. Entertainment options extend well beyond a casual stroll through The Ambassador’s manicured grounds and include access to a full theater with cinema-style seating, billiard room, fine art studio, library, and so much more. Services at The Ambassador also include practical considerations, like weekly housekeeping, linen and laundry service, and transportation. At The Ambassador of Scarsdale, our philosophy is to support independence, foster wellness, and create community. Three chef prepared meals daily, bistro snacks and beverages in our Five Corners Bistro, bed making and trash pick-up, weekly housekeeping, linen and personal laundry, a diverse calendar of activities all in the comfort of home in this luxurious setting. Also included is scheduled transportation to local appointments, occasional cuing for personal care, observations checks, case management, and encouragement to participate in the extensive programming provided through our Activity Department. In addition to our Residence Package, our care team of Registered Nurse and Case Manager will customize a care plan based on each resident's individual needs, if any. If a resident's needs change at any time, care plans can be customized to meet those needs on a temporary or permanent basis. The Ambassador is staffed with 24/7 licensed nurses with a philosophy of service and caring. Our goal is to meet individual needs in the comfort and privacy of home at The Ambassador. We are here to help and serve.